To self-publish or not to self-publish… that seems to be the question for many authors pondering how to make their break in the writing world, and especially for those who have been querying for years with no success. 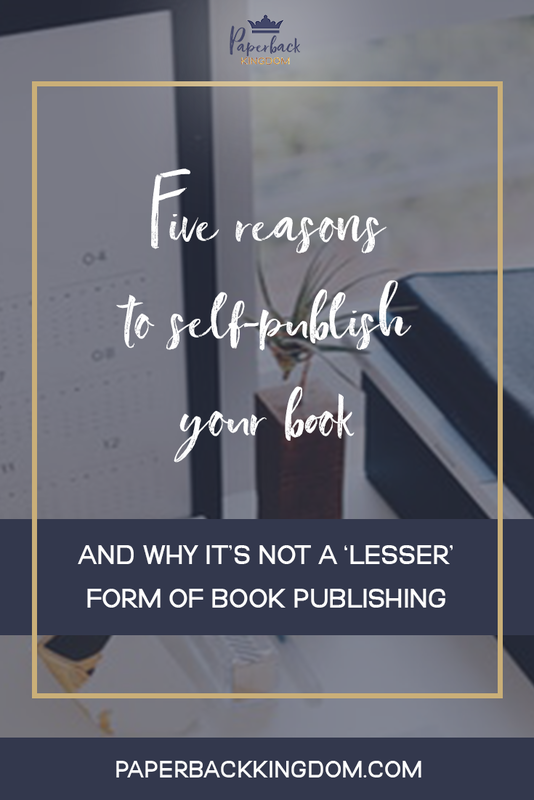 I don’t favour self-publishing over traditional publishing–I honestly believe it depends on the book, the circumstances, and a lot of other personal factors, but if you’re on the fence and need some guidance, I have five solid reasons for why self-publishing is an excellent choice. There’s nothing quite like being in full control over your work, and being your own boss comes with a lot of great perks! You don’t have to worry about pressing deadlines, because you can make sure the deadlines suit your own schedule. 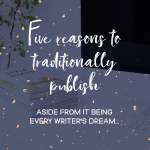 Plus, you don’t have to wait a year for your book to get to publication–if you really wanted to, you could publish it within 6 months, or even a day (but maybe don’t do this–more on why below). There are many statistics that indicate self-publishing and Amazon are taking over the book market–and while there are many perks (especially for first time authors) that come with signing traditionally, if you want to consider long term results and opportunities, self-publishing gives you more legroom to grow. When you traditionally publish, you are bound by contracts and obligations. 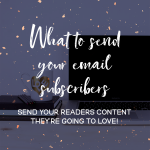 But when you self-publish, you’re free to try a variety of marketing tactics, platforms, and avenues to attract readership and make sales. If you’re creative enough, you can really make a business out of self-publishing and reap the full profits for your efforts. It’s amazing to be able to say “I wrote a book”. That in itself is a huge achievement. Granted, not everybody is going to recognise how amazing of an achievement that is. Those who aren’t in the book industry don’t understand the amount of work that goes into publishing and marketing a book from scratch, let alone building a career as an author. But writers know how hard it is, and if you can pull it off, you’ll earn a great deal of respect from writers everywhere when you hit that bestseller’s list. Okay, I know I just said it is hard but that’s putting all the work of building presence, publicity, and sales into perspective. Realistically, it’s not that hard to self-publish once you figure out how to go about it. You get to avoid rejections, long waiting periods, and basically jump the cue. It doesn’t mean your work has less value–it just means you’re taking matters into your own hands instead of seeking professional help. And speaking of professionalism, you can quite easily learn the ropes and then use that knowledge to build your own publishing team for solely your books–with you as the SEO of the whole operation. You get to outsource the jobs you don’t like to people who’ll get it done for you, so that you can focus on the writing side of things. Remember back in point 1 when I said you probably shouldn’t publish in a day? Well, this is exactly why. You could publish in a day. You could publish today if you really wanted to! This is because all it really takes to ‘publish’ a book is to have a manuscript, a book cover, upload it to a distributor and click ‘publish’. But if you want to succeed, you’ll want to get it edited, formatted, implement a launch plan and have a marketing strategy behind you. And that’s where I come in–as a professional writing coach + business strategist specialising in helping fiction authors, it’s exactly my job to guide you and make sure you have all your ducks in a row for a successful debut into the book world. 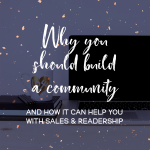 The only question left to ask is… if you’ve spent the past 20 years querying but haven’t built an audience, or you know you want to self-publish and are ready to jump in… what are you waiting for? Are you ready to get published? 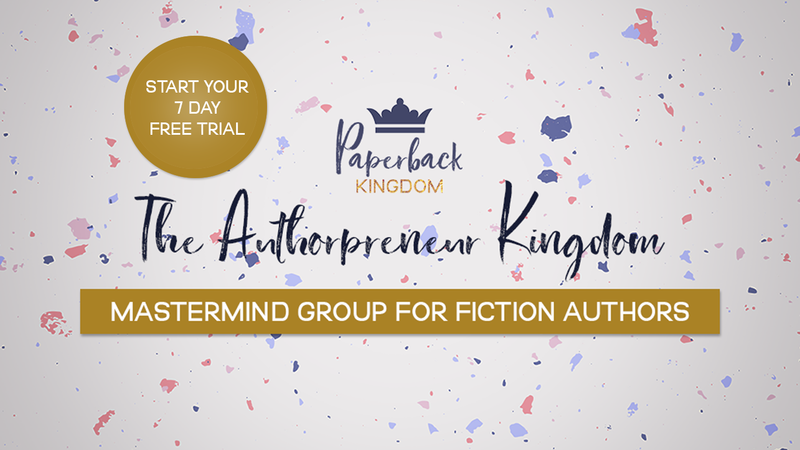 Check out my monthly membership for ambitious fiction authors and learn the easiest & cheapest ways to start publishing today.